PM Netanyahu attends induction ceremony for new nuclear research center director. 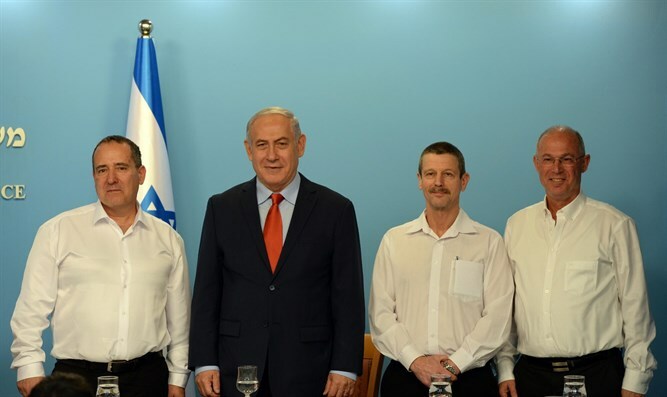 Israeli Prime Minister Binyamin Netanyahu on Thursday at the Prime Minister's Office in Jerusalem, attended the induction ceremony for the new director of the Nuclear Research Center - Negev (NRCN). Gil Dagan, a 16-year NRCN veteran who has held a variety of positions, has been appointed to replace outgoing director Dr. Udi Netzer. The Prime Minister thanked Dr. Netzer and wished Dagan success. "You are engaged in establishing the present and ensuring the future of the people of Israel," Netanyahu said. He noted that Dr. Netzer has significantly advanced the NCRN and its workers and built a strong infrastructure for long-term development that will meet the future needs of the State of Israel, adding that he was sure that Dagan would continue this trend. Israel Atomic Energy Commission Director Zeev Senir said, "The NRN is characterized by excellent people. Udi Netzer led this trend of excellence and I am certain that the NRN will enjoy continued success under Gil Dagan."